Your Tacoma is your baby, right? You treat it with kid gloves, wash and buff it frequently so it shines like a beacon, and never neglect an oil change, never overlook a scratch, etc. But, when you sit back and admire your Tacoma, something just doesn’t sit right…You need to get that bad boy out into the mud! Driving your Tacoma off-road can be a great time, but if you’ve never done it before, there are some things you should know. 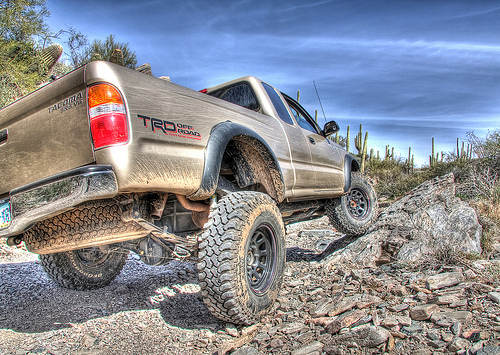 A formidable machine like the Tacoma wasn’t designed for you to simply parade it up and down the pavement. It needs a respite from the boring flat asphalt; it craves the bumping and grinding of some rocky and uneven terrain. However, unless you’re a born natural off-roader, you’ve got a bit of learning to do. As an off-road newbie, you’ve got to learn a few fundamentals, make some preparations, and educate yourself on the trails and terrain in your area. 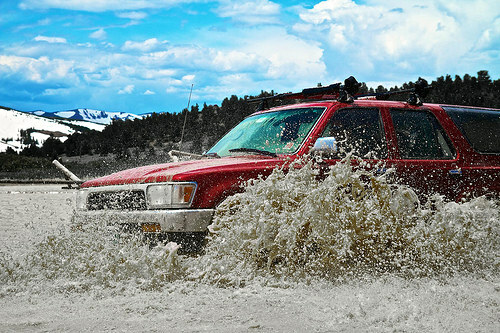 It’s very important that you know your pickup’s capabilities and limitations; your Toyota Tacoma is a tremendously adept vehicle for off-road activities, even in its standard form. But these capabilities are expanded greatly if you have some of the optional upgrades included. First of all, if you didn’t opt for the Toyota Racing Development (TRD) off-road package that includes off-road shocks, a heavy-duty skid plate, etc., no worries. Even a basic 2wd Tacoma is a decent off-road vehicle in the right hands. Make sure you know where are your tow hooks/tow points are, and be sure you can find them even when they’re covered with mud. Before you set out for some rugged exploration, you need to know what you are getting yourself into. To that end, you have some options. An easy and inexpensive option is to visit the local office of whatever public land agency that manages the land on which you’ll be driving. In many areas of the country, this is the local US Forest Service Ranger District, though there are also state and other federal agencies that manage land such as the Bureau of Land Management and the National Park Service. When you visit the local office (or look them up on the web when an in-person visit is not feasible), ask for suggestions about where to go to do the kind of off-road activities that you want to pursue. Another option is to purchase an off-road trail book for your area – you can find them at your local 4×4 shop or online. Additionally, websites like EveryTrail.com or TrailDamage.com can be good resources as well. River crossings are good clean fun, but pay attention to the weather, as rivers can swell quickly. Finally, take into consideration how the weather and seasonal conditions will affect your experience. A good rain can turn an easy dirt trail into a muddy mess, or make what was once a shallow stream crossing an impassable river. It’s not very bold to say this, but before heading out on any off-roading excursion, take all the safety precautions possible. You just never know what you’ll be getting into any time you tread into the backcountry. A flashlight, LED signal beacons (flares are less desirable because of the fire risk), a camp shovel, first aid kit, and basic hand tools are good. A cell phone charger that uses alkaline batteries isn’t a bad idea either, just in case you need to make a call and your vehicle battery is dea. Additionally, while it’s not safety equipment, a hi-lift jack, some tow straps, and a tree strap with a d-shackle can sometimes get you un-stuck if you’re in a bind (and all this gear is less than $200 combined). Finally, a good safety recommendation is to bring along a passenger for your off-road trip, as well as to tell someone where you’re going and when you plan to return. Checking in and out with the local forest ranger is a good idea too. There is an unfortunate stereotype floating around that off-roading is all about tearing up the landscape as much as possible, wreaking havoc on the ecosystem, etc. to get a few kicks. This isn’t true, and you’ll want to make sure you aren’t doing anything to perpetuate this myth. The reality is that the off-road hobby is one of discretion and finesse, with the object being to traverse difficult ground and navigate through challenging terrain while having minimal impact on the environment. To that end, you’ll want to familiarize yourself with the Tread Lightly principles and incorporate them into your off-road adventures. You won’t be blazing new trails, intentionally spinning up soil, disturbing wildlife or altering their ecosystem, or leaving trash and other refuse behind. If you do these kinds of things you risk hefty fines from law enforcement, but most importantly you are a stain on the good name of ethical off-roaders and your actions serve to paint us all with a broad brush and aid those that want to shut down our forests to recreational access. Leave your surroundings looking the same as when you arrived. Be responsible and ethical in all that you do and we can ensure that off-roading is a hobby that can be enjoyed for generations to come. Russ, these are SWEET! And you’re right, if you’re going to be off-roading on any type of consistent basis, a heavy-duty truck bumper is a must. You can easily do a lot more costly damage than price of these bumpers. I would really like to go off roading in my Tacoma but I know that my Tacoma doesn’t have the modifications needed to really help support it. I pretty much leave my truck standard mainly for hauling stuff. Not too many great terrains in my area also.